Hey folks. 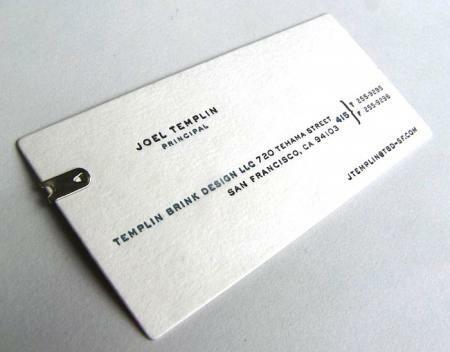 Does anybody know what this little metal clip is on the left side of this business card? I have seen them used on a few different pieces from Studio on Fire and others. I really like them, but for the life of me I can’t figure out what they are or where to get them. Just a wild guess, but try clothing packaging. They make me think of when you buy a new men’s shirt and there’s that piece of cardstock clipped to the underside of collar to keep its shape in the package. Or the clips to keep two socks together in the package. Good idea. I’ll do some more googling. If anyone else knows… chime in. I want some BAD! Well…in Portland, Oregon, there’s a store that sells books and cd’s etc. in Japanese. They have a selection of pens, pencils, notebooks, brushes, and an assortment of articles whose use is not always clear without instructions in English, but which may be generally classified as stationery related. If you have a similar store in your area, you might try looking there. Even an ordinary stationery store may have a lead, or a catalog you can look at. There’s also one in Seattle, and it’s hard to imagine that San Francisco and Los Angeles don’t have branches or similar stores. I have some of these paper fasteners, but unfortunately do not have the original box. They have the initials “OK” impressed in them. I think I acquired these at an office supply store when I was a kid, and they have always been in a little cabinet in my printshop. A quick search found this box which could well be like the box I purchased as a Kid, but I seem to recall it was a cylindrical box with crimped cardboard lids. In my search, I also found a story in a fish and wildlife journal which indicated that they were tracking fish populations my crimping “OK paper fasteners” on the fins. I have not found any current listings of these fasteners for sale. I don’t know if your still looking for them but they are called “Paper Fasteners”, go figure right, I found some online here (http://www.poetsdreams.com/7%20Gypsies.htm) about half way down the page. They come in brass & silver. Cheers! Try ACE hardware stores. You just need a piece of soft metal shaped in “U” and then press-fold it in the card. Hey, Homedepot.